Should we call ISIS 'evil'? 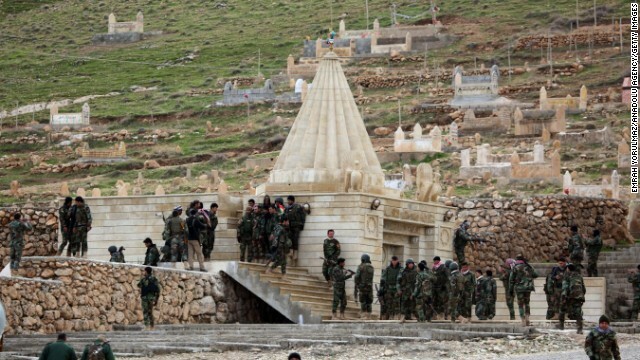 Kurdish Peshmerga fighters assemble at a shrine on Iraq's Mount Sinjar on Friday, December 19. 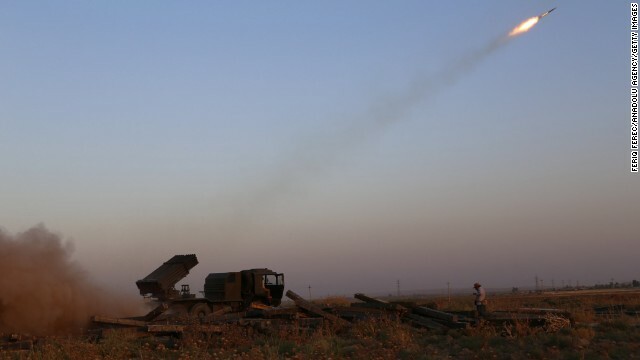 The Kurdish military said that with the help of coalition airstrikes, it has "cleansed" the area of ISIS militants. 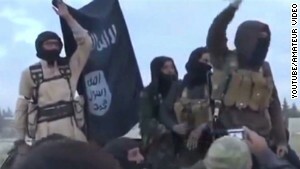 ISIS has been advancing in Iraq and Syria as it seeks to create an Islamic caliphate in the region. 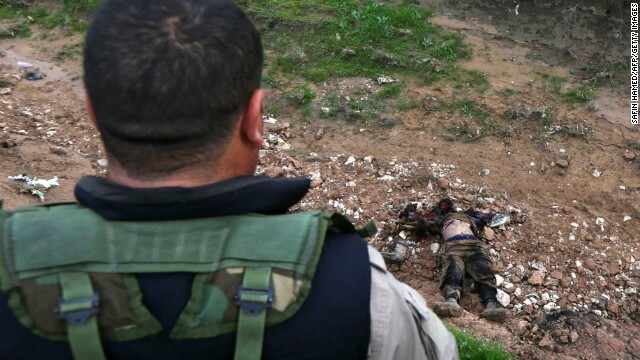 A Peshmerga fighter looks down at the body of an alleged ISIS fighter in Zummar, Iraq, on Thursday, December 18. 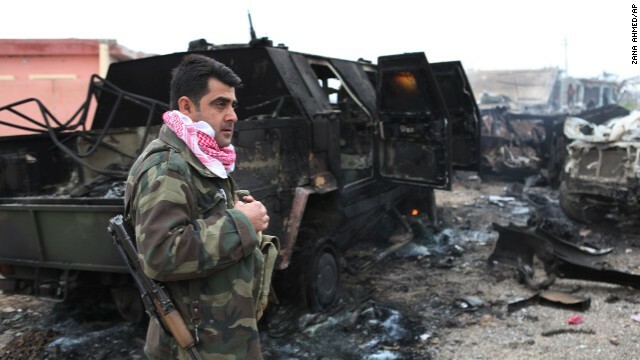 A Kurdish fighter stands next to a destroyed armored vehicle in northern Iraq on December 18. 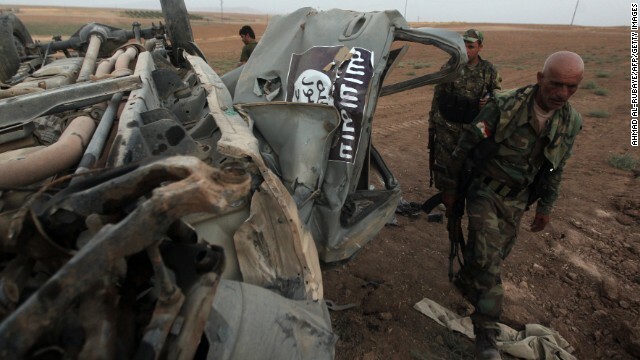 The vehicle was destroyed by an improvised explosive device placed by ISIS militants. 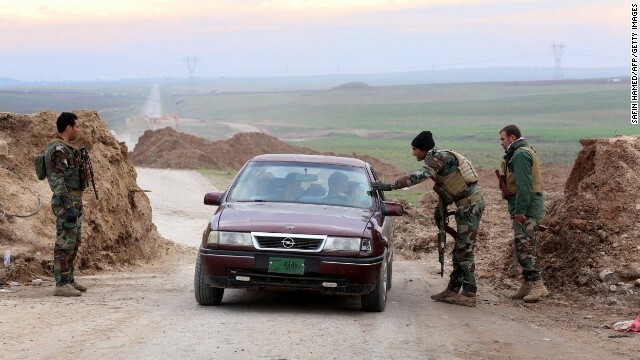 Peshmerga fighters stop to check a vehicle in Zummar on December 18 as they continue to battle ISIS fighters near the border with Syria. 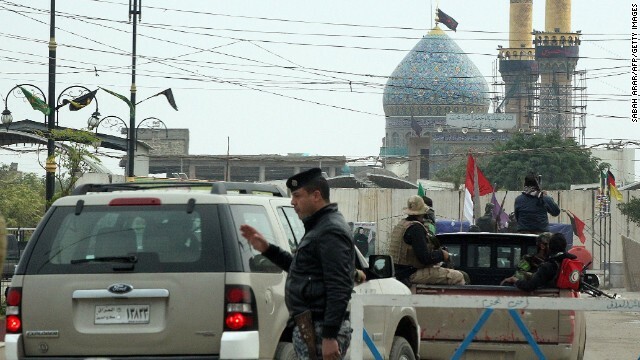 Pro-Iraqi government forces guard a shrine in Balad, Iraq, on Monday, December 15. 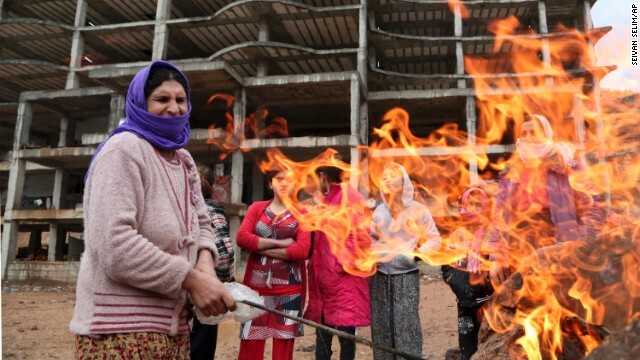 A Yazidi woman displaced by ISIS militants tends to a fire Wednesday, December 10, at a shelter in Dohuk, Iraq. A Kurdish child from the Kobani, Syria, area holds laundry at a refugee camp in Suruc, Turkey, on Monday, November 17. 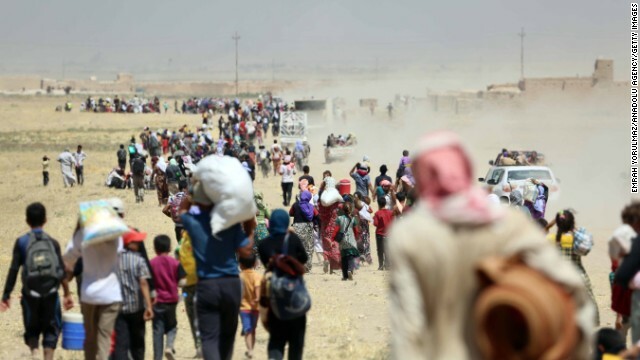 Tens of thousands of people have fled Kobani, known in Arabic as Ayn al-Arab, to escape ISIS. 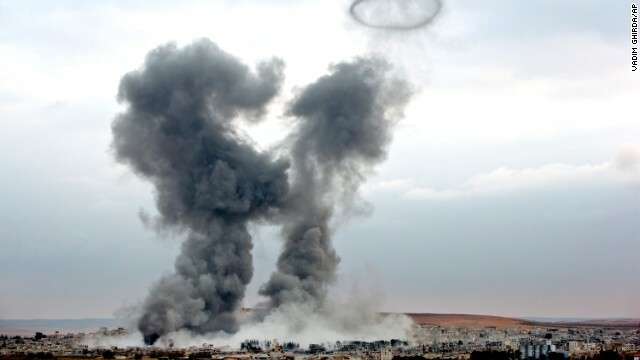 Smoke rises from Kobani following airstrikes on November 17. 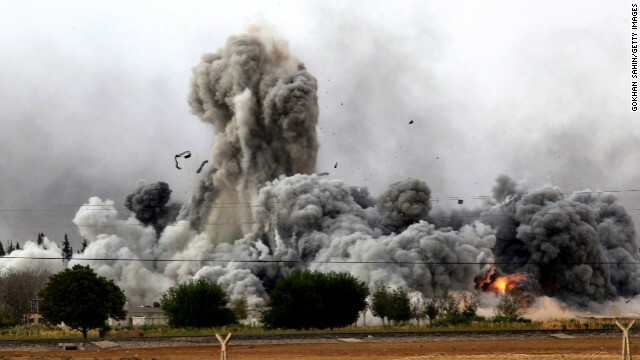 The United States and several Arab nations have been bombing ISIS targets to take out the group's ability to command, train and resupply its fighters. 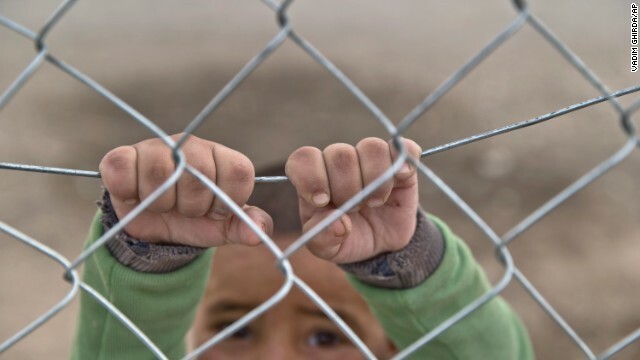 A Kurdish child from the Kobani area holds on to a fence at a refugee camp in Suruc on Sunday, November 16. 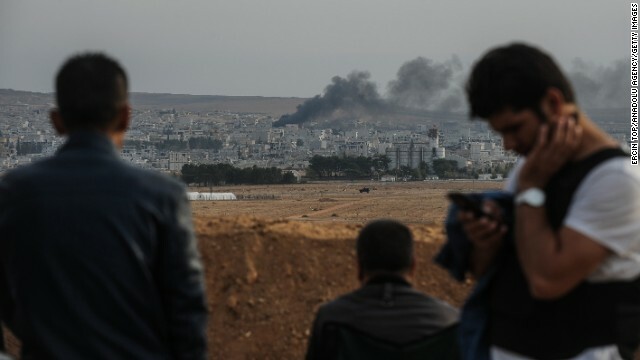 People in Suruc watch smoke rise near the Syrian border during clashes between ISIS members and armed groups on Thursday, November 13. 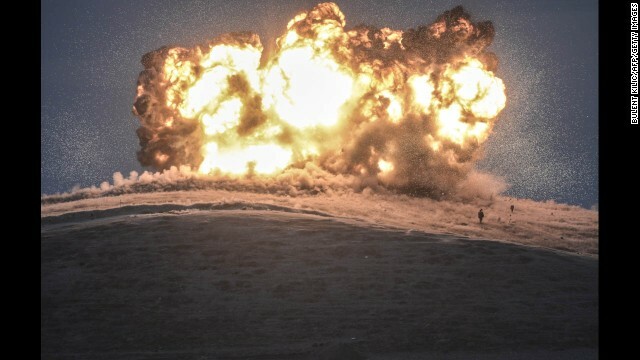 A bomb (upper left) falls on an ISIS position in Kobani during an airstrike by the U.S.-led coalition on Saturday, November 8. 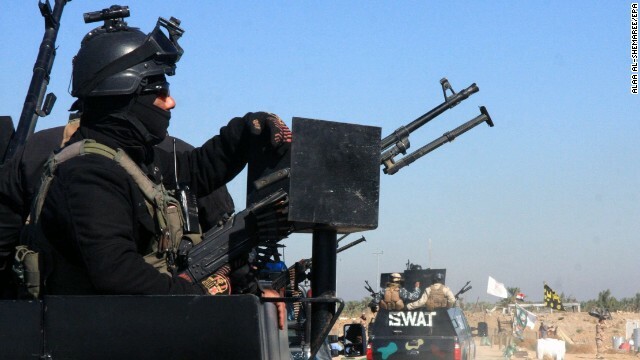 Iraqi military forces take up position in Jurf al-Sakhar, Iraq, on November 8. 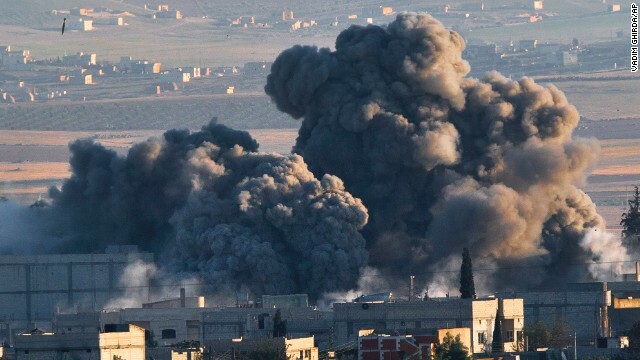 Fire and smoke rise from Kobani following airstrikes against ISIS on Thursday, October 30. 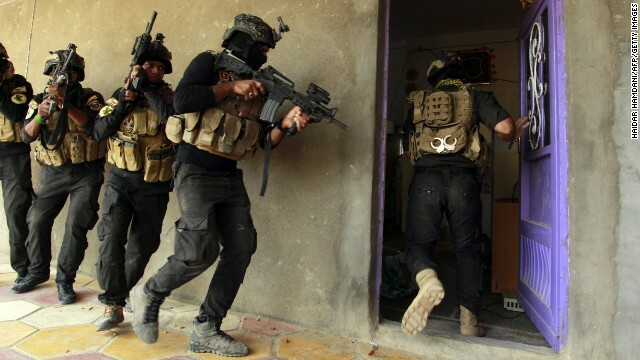 Iraqi special forces search a house in Jurf al-Sakhar on October 30 after retaking the area from ISIS. 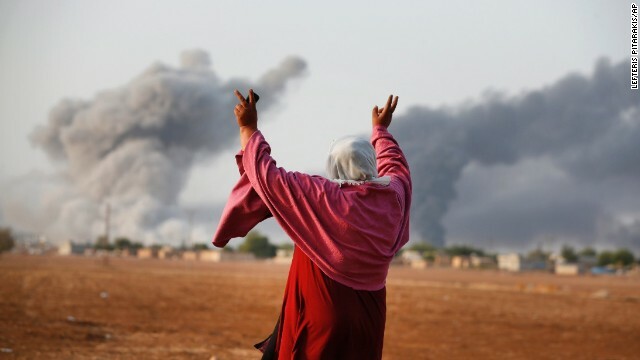 Smoke rises during fighting in Kobani on Monday, October 27. 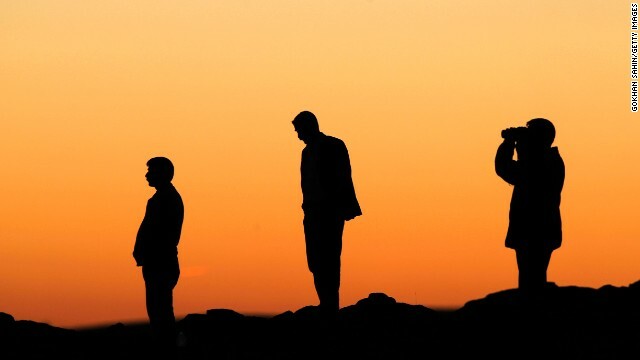 ISIS militants stand near the site of an airstrike near the Turkey-Syria border on Thursday, October 23. 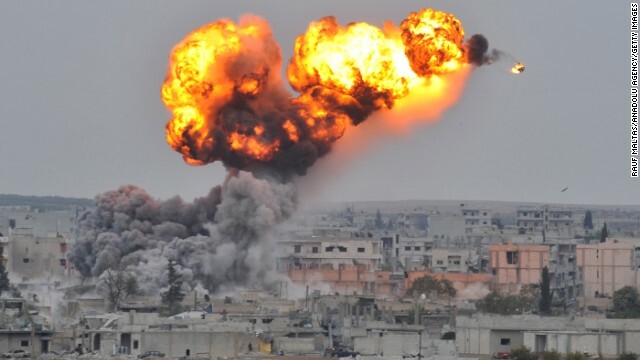 An explosion rocks Kobani during a reported car-bomb attack by ISIS militants on Monday, October 20. People watch Kobani from a hill near the Turkey-Syria border on October 20. 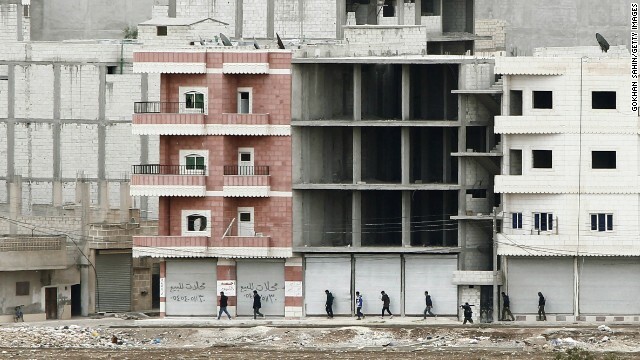 Kurdish fighters walk to positions as they fight ISIS forces in Kobani on Sunday, October 19. 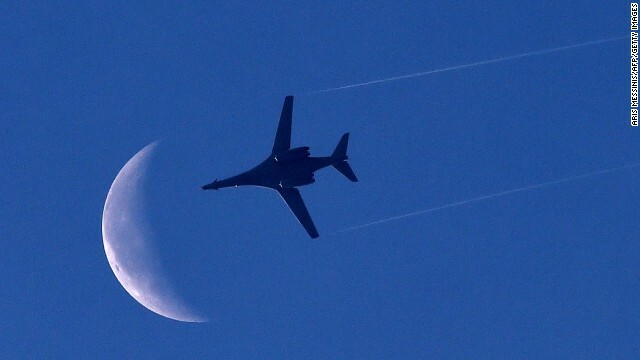 A U.S. Air Force plane flies above Kobani on Saturday, October 18. 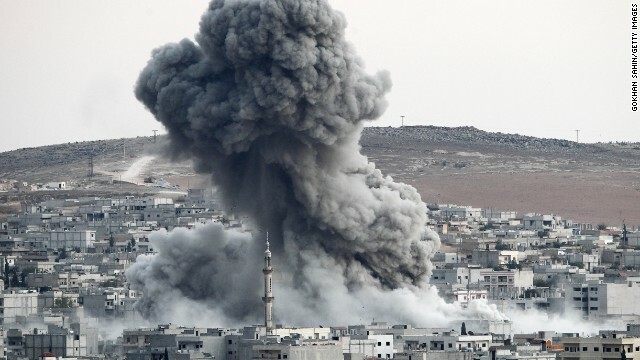 Heavy smoke rises in Kobani following an airstrike by the U.S.-led coalition on Saturday, October 18. 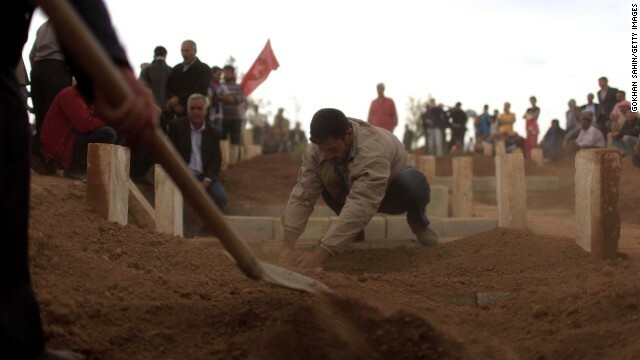 Cundi Minaz, a female Kurdish fighter, is buried in a cemetery in the southeastern Turkish town of Suruc on Tuesday, October 14. Minaz was reportedly killed during clashes with ISIS militants in nearby Kobani. 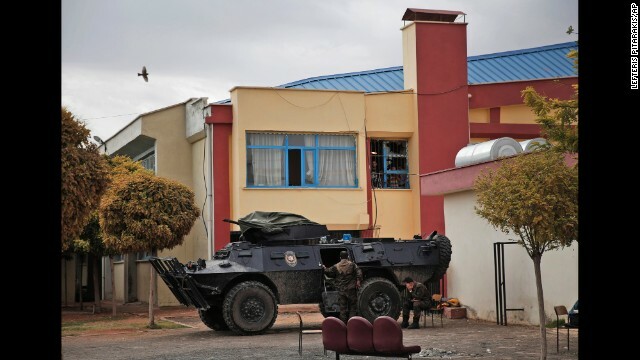 Turkish police officers secure a basketball stadium in Suruc on October 14. 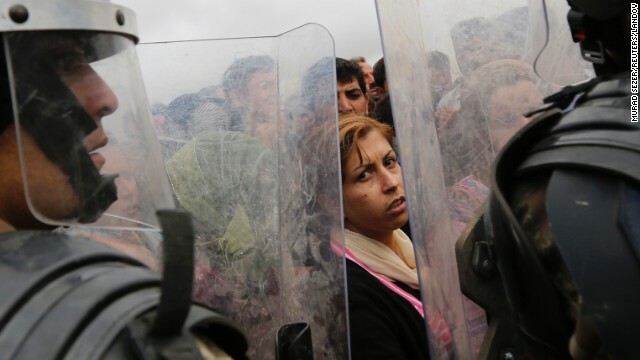 Some Syrian Kurds have been held there since crossing from Syria into Turkey. Kiymet Ergun, a Syrian Kurd, celebrates in Mursitpinar, Turkey, after an airstrike by the U.S.-led coalition in Kobani on Monday, October 13. 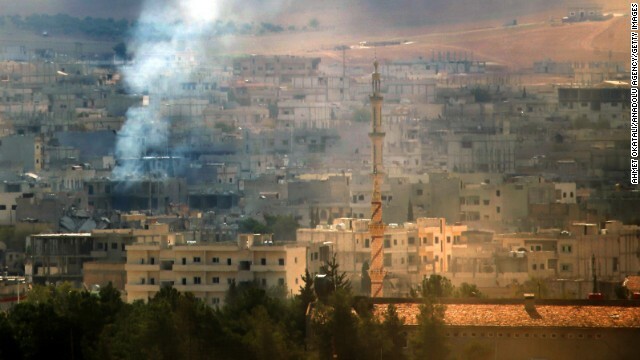 Smoke rises from Kobani on Sunday, October 12. 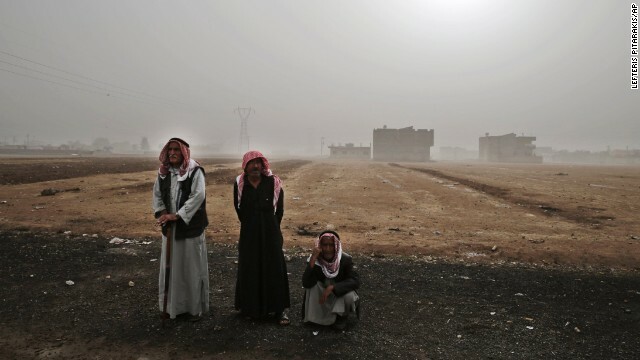 Syrian Kurds from Kobani stand outside the grounds of a refugee camp in Suruc on Saturday, October 11. 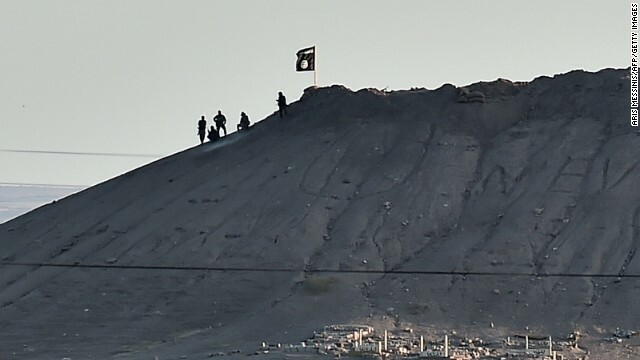 Alleged ISIS militants stand next to an ISIS flag atop a hill in Kobani on Monday, October 6. 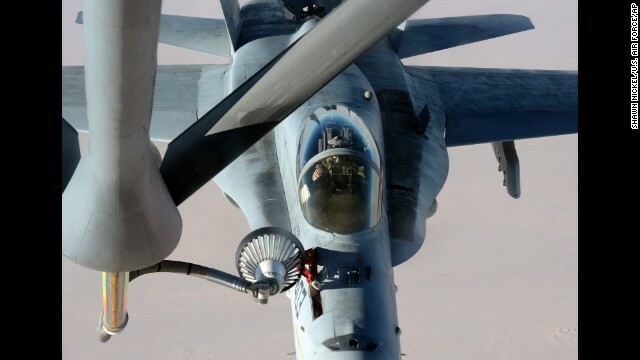 In this photo released by the U.S. Air Force on Saturday, October 4, a U.S. Navy jet is refueled in Iraqi airspace after conducting an airstrike against ISIS militants. 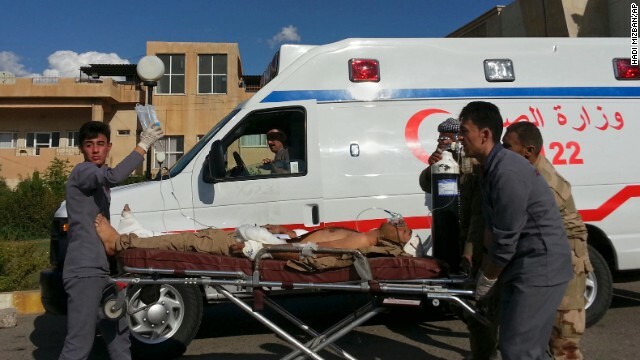 A Kurdish Peshmerga soldier who was wounded in a battle with ISIS is wheeled to the Zakho Emergency Hospital in Duhuk on Tuesday, September 30. 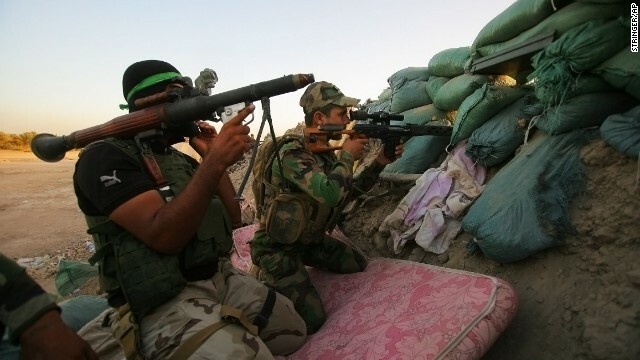 Iraqi Shiite militiamen aim their weapons during clashes with ISIS militants in Jurf al-Sakhar on Sunday, September 28. Syrian Kurds wait near a border crossing in Suruc as they wait to return to their homes in Kobani on Sunday, September 28. 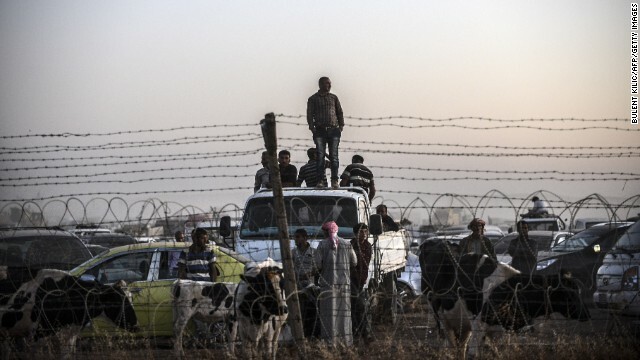 Syrian Kurds wait behind border fences to cross into Suruc on September 28. 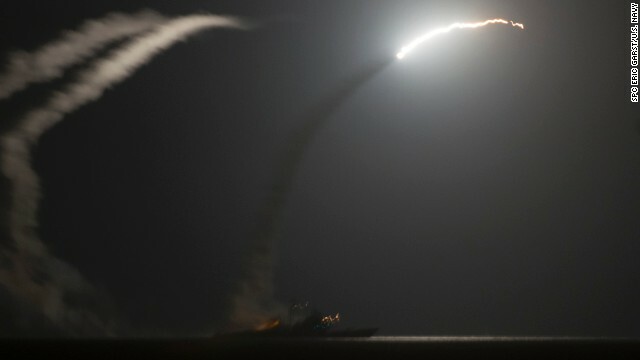 Tomahawk missiles, intended for ISIS targets in Syria, fly above the Persian Gulf after being fired by the USS Philippine Sea in this image released by the U.S. Navy on Tuesday, September 23. 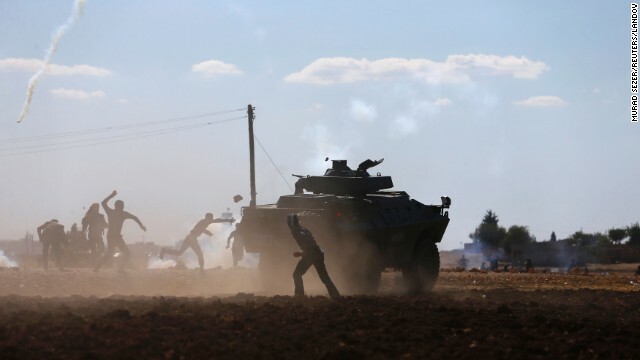 Turkish Kurds clash with Turkish security forces during a protest near Suruc on Monday, September 22. According to Time magazine, the protests were over Turkey's temporary decision to close the border with Syria. 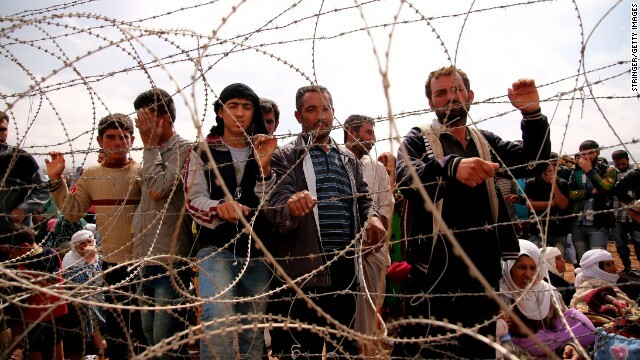 Syrian Kurds fleeing ISIS militants wait behind a fence in Suruc on Sunday, September 21. 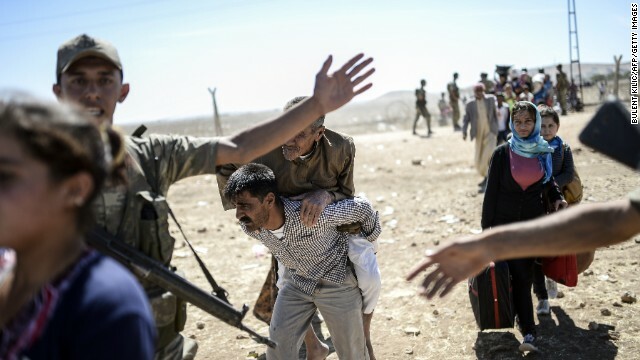 A elderly man is carried after crossing the Syria-Turkey border near Suruc on Saturday, September 20. 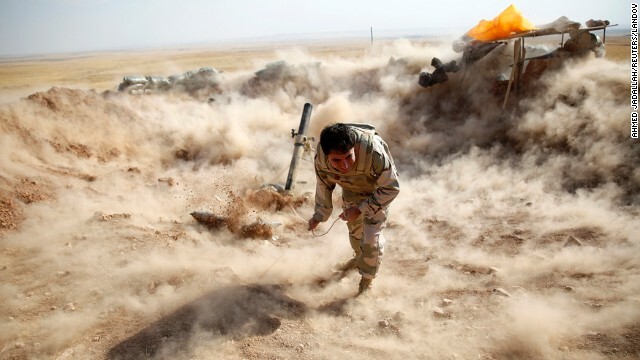 A Kurdish Peshmerga fighter launches mortar shells toward ISIS militants in Zummar on Monday, September 15. An ISIS flag flies on the other side of a bridge at the front line of fighting between ISIS and Kurdish Peshmerga fighters in Rashad, Iraq, on Thursday, September 11. 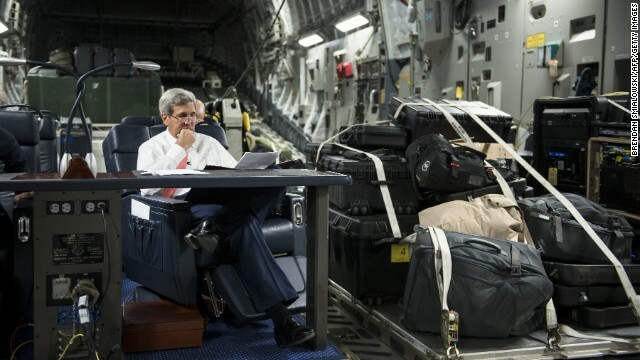 U.S. Secretary of State John Kerry reads on a flight en route to Iraq on Wednesday, September 10. Kerry traveled to the Mideast to discuss ways to bolster the stability of the new Iraqi government and combat ISIS. 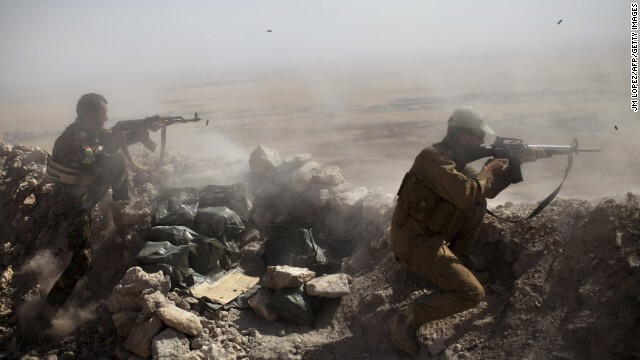 Kurdish Peshmerga fighters fire at ISIS militant positions from their position on the top of Mount Zardak, east of Mosul, Iraq, on Tuesday, September 9. 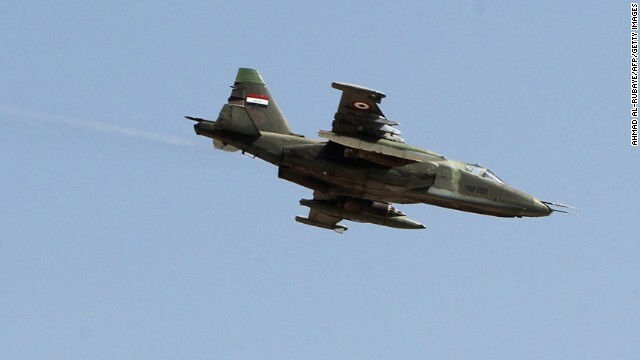 An Iraqi fighter jet flies over Amerli, Iraq, on September 3. 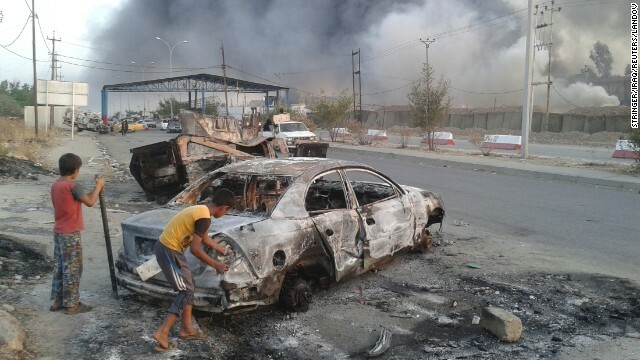 Amerli had been under siege by ISIS militants. 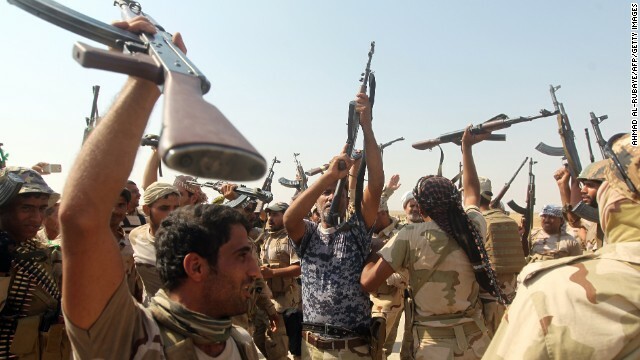 Iraqi volunteer fighters celebrate breaking the Amerli siege on Monday, September 1. 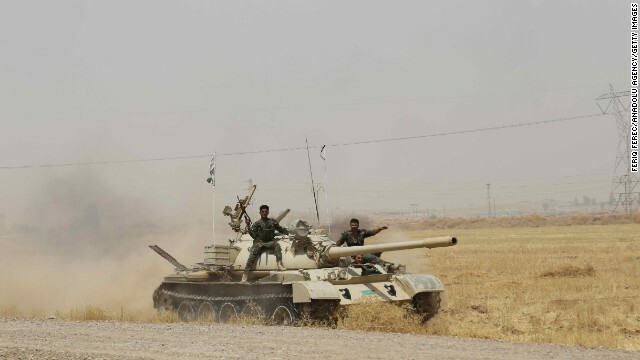 ISIS militants had surrounded Amerli, 70 miles north of Baquba, Iraq, since mid-June. 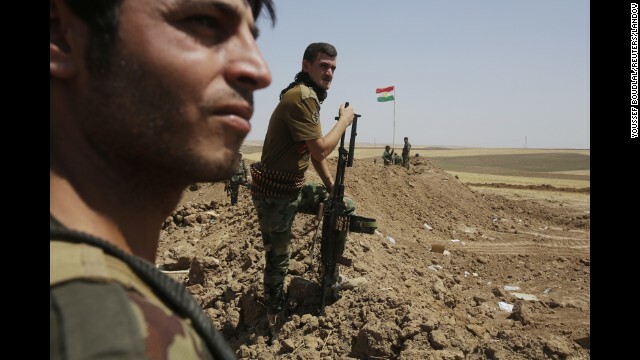 Kurdish Peshmerga forces stand guard at their position in the Omar Khaled village west of Mosul on Sunday, August 24. 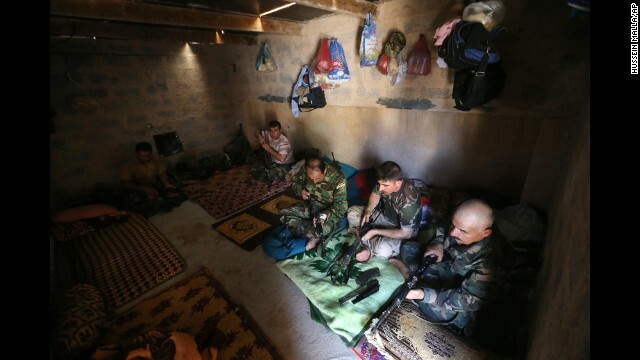 Kurdish Peshmergas fight to regain control of the town of Celavle, in Iraq's Diyala province, on August 24. 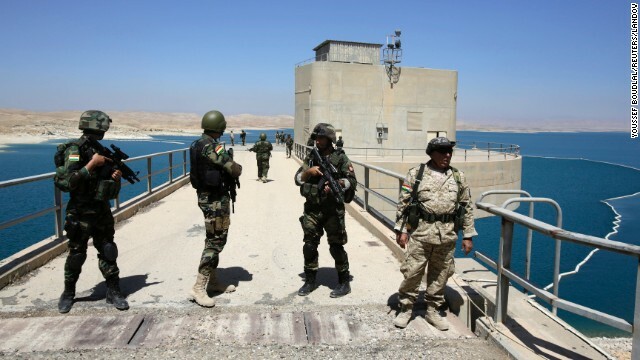 Peshmerga fighters stand guard at Mosul Dam in northern Iraq on Thursday, August 21. 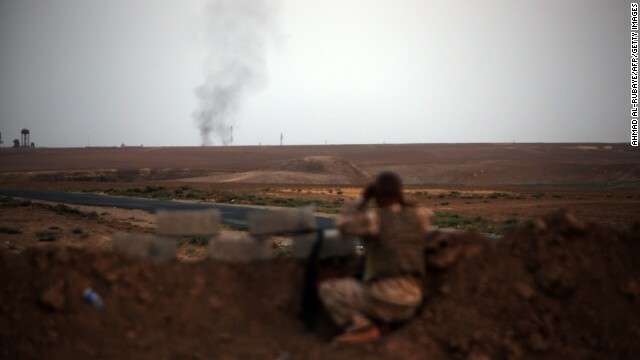 With the help of U.S. military airstrikes, Kurdish and Iraqi forces retook the dam from ISIS militants on August 18. A breach of the dam would have been catastrophic for millions of Iraqis who live downstream from it. Displaced Iraqis receive clothes from a charity at a refugee camp near Feeshkhabour, Iraq, on Tuesday, August 19. 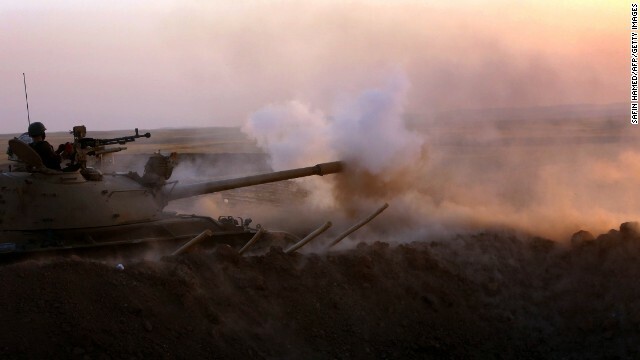 A fighter with Kurdish Peshmerga forces battles ISIS militants near Mosul on Monday, August 18. Peshmerga fighters inspect the remains of a car that reportedly belonged to ISIS militants and was targeted by a U.S. airstrike in the village of Baqufa, north of Mosul, on August 18. 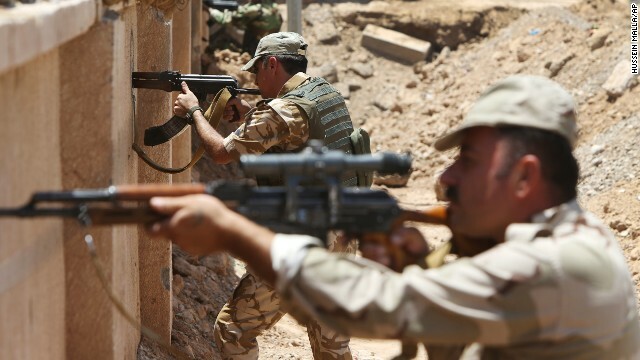 Kurdish Peshmerga fighters fire at ISIS in Khazair, Iraq, on Thursday, August 14. 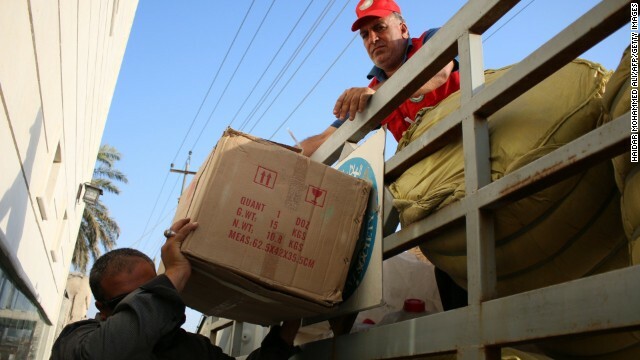 Volunteers of the Iraqi Red Crescent Society unload boxes of goods before distributing them August 14 to families who fled from ISIS. From the flight deck of the USS George H.W. 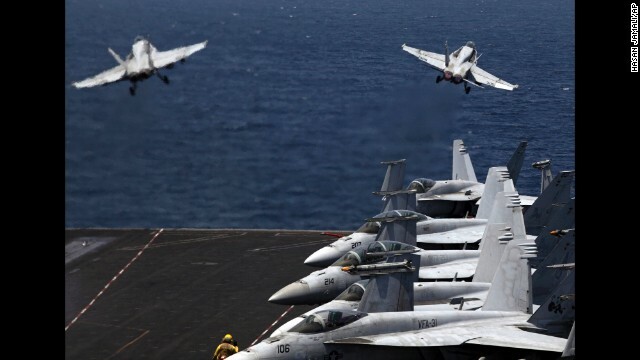 Bush, which is in the Persian Gulf, two U.S. fighter jets take off for a mission in Iraq on Monday, August 11. U.S. President Barack Obama authorized airstrikes against Islamic militants and food drops for Iraqis who are trapped by the militants. 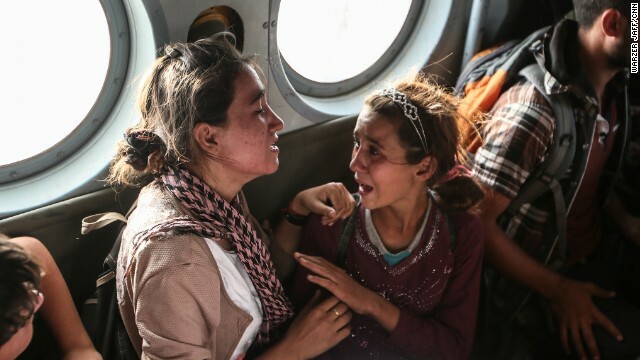 Aziza Hamid, a 15-year-old Iraqi girl, cries for her father while she and some other Yazidi people are flown to safety Monday, August 11, after a dramatic rescue operation at Iraq's Mount Sinjar. A CNN crew was on the flight, which took diapers, milk, water and food to the site where as many as 70,000 people were trapped by ISIS. But only a few of them were able to fly back on the helicopter with the Iraqi Air Force and Kurdish Peshmerga fighters. 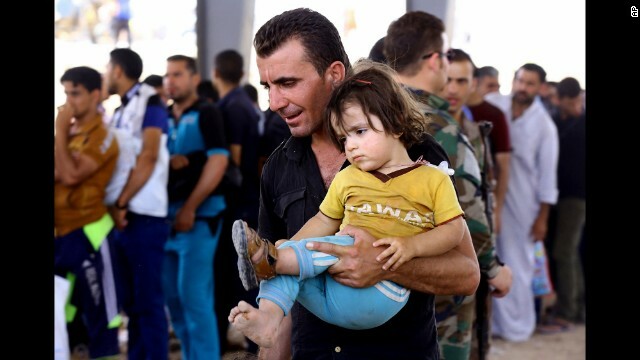 Thousands of Yazidis are escorted to safety by Kurdish Peshmerga forces and a People's Protection Unit in Mosul on Saturday, August 9. 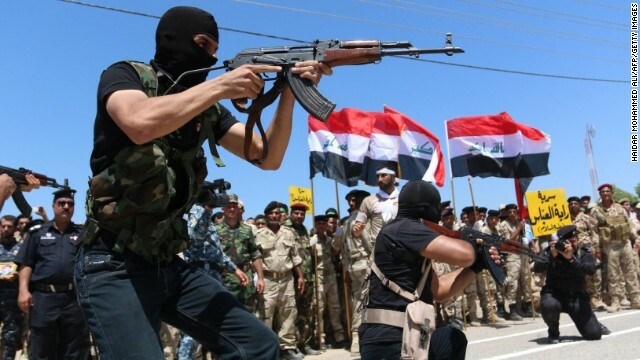 Iraqi Shiite volunteers who have joined government forces to fight ISIS take part in a training session near Basra, Iraq, on Thursday, August 7. 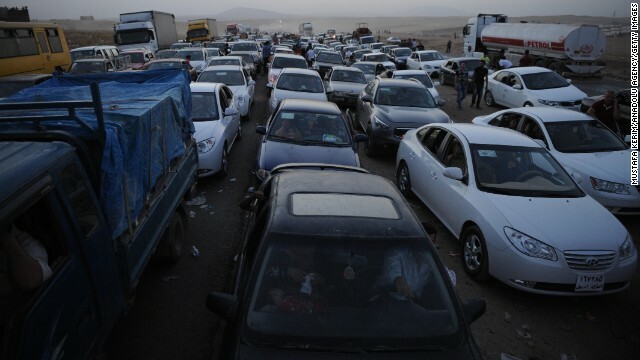 Thousands of Yazidi and Christian people flee Mosul on Wednesday, August 6, after the latest wave of ISIS advances. 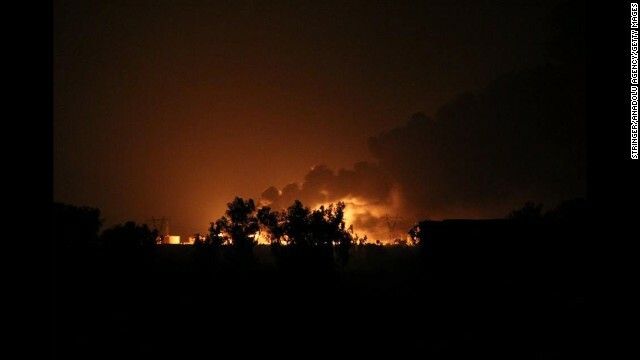 A Baiji oil refinery burns after an alleged ISIS attack in northern Selahaddin, Iraq, on Thursday, July 31. 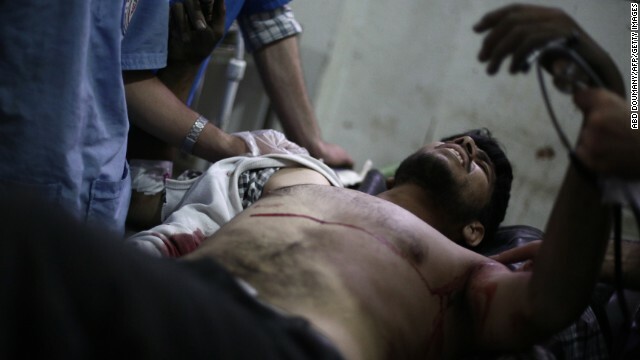 A Syrian rebel fighter lies on a stretcher at a makeshift hospital in Douma, Syria, on Wednesday, July 9. He was reportedly injured while fighting ISIS militants. 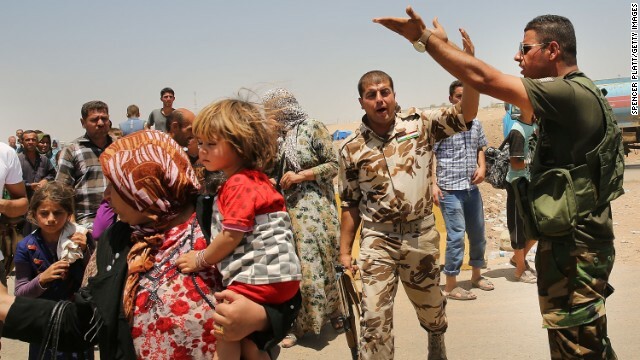 Iraqis who fled fighting in the cities of Mosul and Tal Afar try to enter a temporary displacement camp in Khazair on Wednesday, July 2. 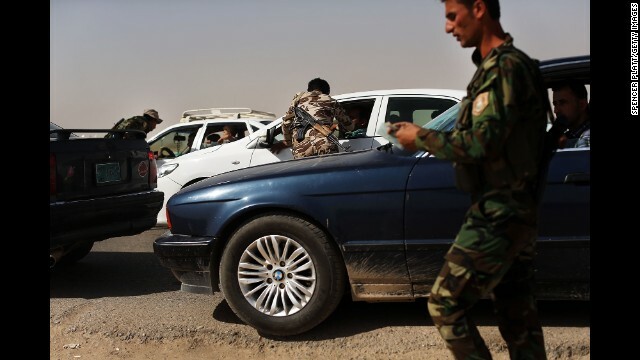 Peshmerga fighters check cars at the entrance of a temporary displacement camp in Khazair on Thursday, June 26. Kurdish Peshmerga take their positions behind a wall on the front line of the conflict with ISIS militants in Tuz Khormato, Iraq, on Wednesday, June 25. Peshmerga fighters clean their weapons at a base in Tuz Khormato on June 25. 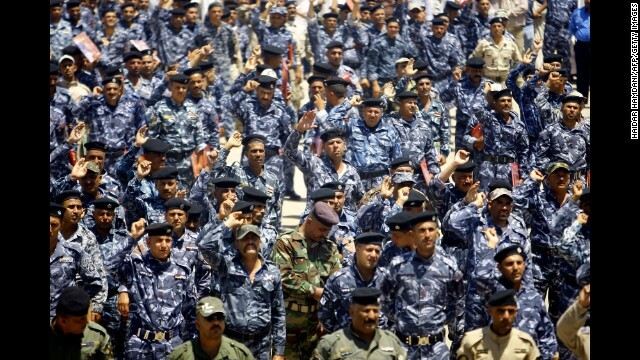 New army recruits gather in Najaf, Iraq, on Wednesday, June 18, following a call for Iraqis to take up arms against Islamic militant fighters. 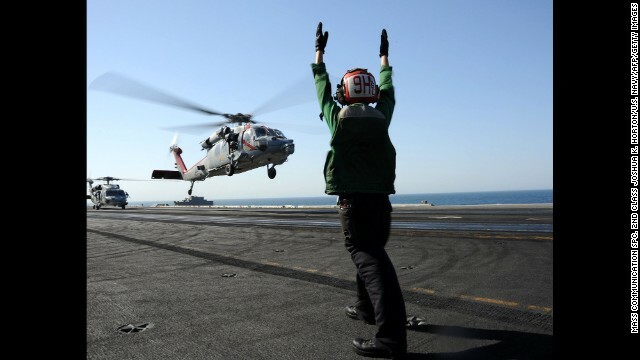 An MH-60R Sea Hawk helicopter lands on the aircraft carrier USS George H.W. Bush in the Persian Gulf on Tuesday, June 17. 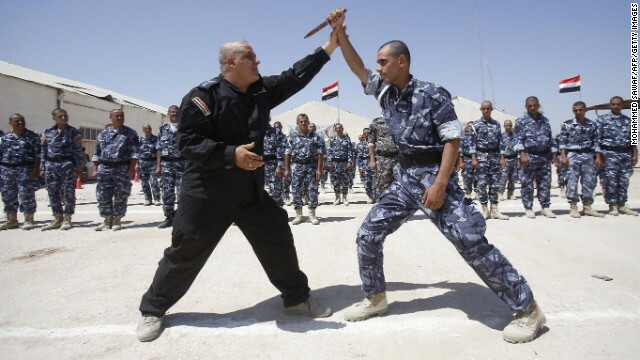 Newly recruited Iraqi volunteer fighters take part in a training session in Karbala, Iraq, on June 17. 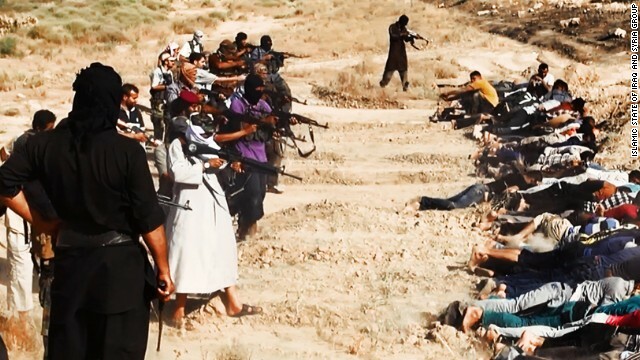 Members of ISIS prepare to execute soldiers from Iraq's security forces in this image, one of many reportedly posted by the militant group online. CNN cannot independently confirm the authenticity of the images. 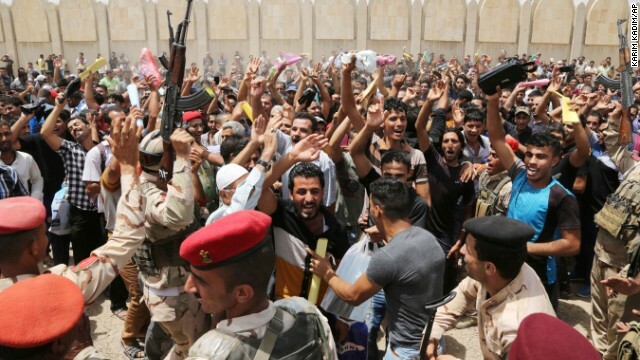 Iraqi men chant slogans outside of an army recruiting center to volunteer for military service Thursday, June 12, in Baghdad. Kurdish Peshmerga forces, along with Iraqi special forces, deploy their troops and armored vehicles outside of Kirkuk, Iraq, on June 12. Children stand next to a burnt vehicle during clashes between Iraqi security forces and ISIS militants in Mosul on Tuesday, June 10. 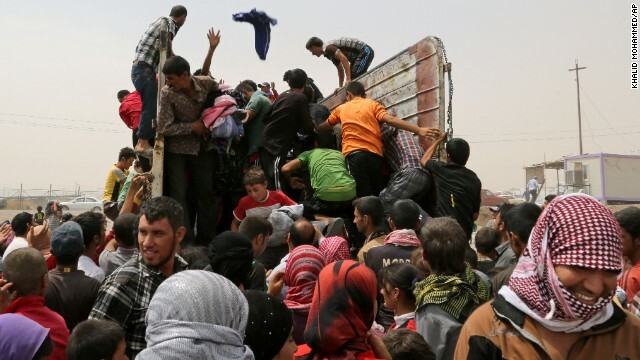 Civilians from Mosul escape to a refugee camp near Irbil, Iraq, on June 10. Editor's note: James Dawes, director of the Program in Human Rights at Macalester College in St. Paul, Minnesota, is the author of "Evil Men" (Harvard University Press). The opinions expressed in this commentary are solely those of the author. 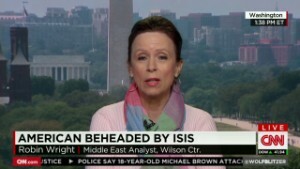 (CNN) -- When most people look at ISIS, they see the incarnation of evil. Among its many horrific acts, the Islamic militant group beheaded American journalist James Foley and posted the video this week in retaliation for U.S. airstrikes in Iraq. The Pope typically protests violence, but he implied that he supports the use of military force to combat ISIS. Even al Qaeda says ISIS is too violent. Across the political spectrum, public officials and pundits have characterized them as "savages," a "cancer" and the "face of evil." The problem with that question is that the answer is as easy as it is useless. Yes, ISIS is evil and must be stopped. Saying so over and over again could very well make it harder to stop them. There is only one good reason to denounce a group as evil -- because you plan to injure them, and calling them evil makes it psychologically easier to do so. "Evil" is the most powerful word we have to prepare ourselves to kill other people comfortably. The flip side is that "evil" is also a word that stops us from thinking. There is no point in trying to understand evil because it is, in the most typical phrasing, "inhuman," "senseless" or "beyond comprehension." It is a fool's quest to analyze the local realities and strategic imperatives of unthinking savages. There is something almost offensive about trying to understand such evil. National Review's Jonah Goldberg tried to shame those who are trying to think seriously about ISIS. In a recent tweet, he mocked the attempt to understand ISIS in its social and political context, suggesting that we should focus instead on one fact: "They're evil. They do obviously evil things for evil ends." 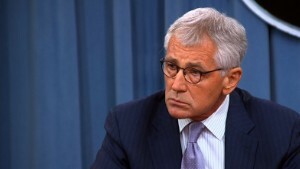 People looking to put ISIS in "context" desperately avoid most obvious context. They're evil. They do obviously evil things for evil ends. The fact is, there are few things more dangerous now than allowing ourselves to think that way. To resist ISIS and, perhaps more importantly, the larger social forces it represents, the U.S. will need more than a collective psychological readiness to injure, and more than bombs. The Wall Street Journal editorialized that this evil ideology will only be stopped when "enough of its fanatics have been killed." 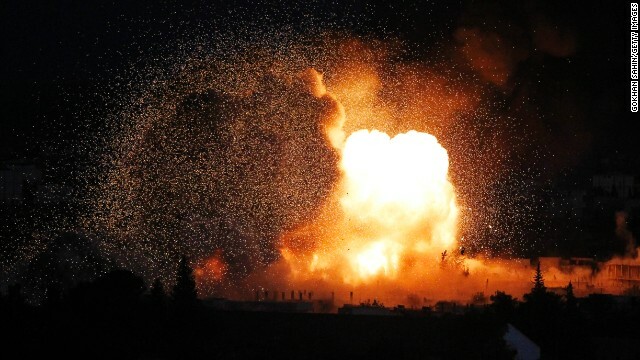 But if we've learned anything as a nation since our "shock and awe" campaign in Iraq, it is this: While invasions and bombing can be effective in the short term, they are not durable solutions to terror-based violence. Who is James Foley's executioner? Even if U.S. military force could effectively destroy ISIS, there will be similar groups waiting in the wings. If we are to have any hope of preventing the spread of extremist ideologies, we must do more than bomb the believers. We must understand them. We must be willing to continue thinking. 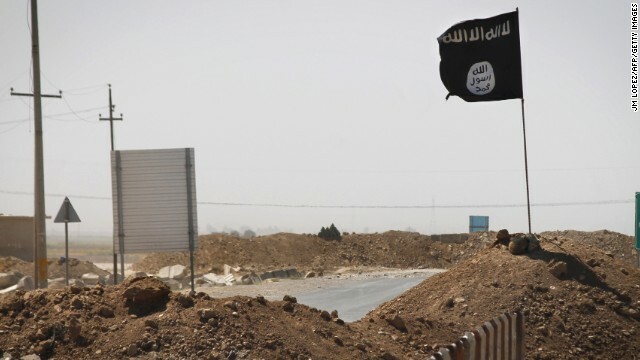 How is ISIS able to achieve the support it needs? What drives people into its ranks? What social pressures and needs, what political and regional vacuums, make it possible for a group like this to thrive? We can choose to answer these questions in two ways. We can say they are evil people doing evil things for evil ends. Or we can do the hard work of understanding the context that made them, so that we can create a context that unmakes them. We can analyze the ways its violent tactics are effective for its purposes given the local power dynamics, so that we can also better understand its weak spots. And we can ask how it is that normal men -- men who were not born evil -- get turned into monsters, so that we can work to change the structures that produce terrorists over the long term instead of locking ourselves into an endlessly repeated, short-term policy of "killing fanatics" until they are gone. Trying to understand something isn't the same as trying to justify or excuse it. That's a basic mistake, and a costly one. As Jane Harman, president of the Woodrow International Center for Scholars, recently wrote: "We can't counter radical narratives if we don't understand the motives of the radicalized." Nonetheless, trying to understand evil is an offense. It is an offense to everything we hold dear, because understanding -- that is, true and effective understanding -- must bring us close to the other, must help us see the world through their eyes. That is a painful, offensive process, and that is exactly what we must do.